Alzheimer’s disease (AD) is a serious and fatal condition affecting tens of millions of individuals worldwide . This form of dementia is primarily believed to be caused by the formation of insoluble polypeptides which form neurodegenerative plaques within the brain. One of the key enzymes involved in this formation is the human aspartic protease BACE-1 . This knowledge together with the fact that no amyloid plaques are found in knock-out mice lacking BACE-1, while they seem to be vital and fertile, make inhibition of BACE-1 an interesting approach for targeting AD [3,4]. Earlier studies of aspartic proteases such as the malaria plasmepsins  and human renin  have shown that the S1 pocket of these enzymes can accommodate large P1 residues, many of which can reach into the S3 pocket. In a previous study we explored the possibility of extending deep into the BACE-1 S1 pocket by employing statine-based inhibitors with phenyloxymethyl residues in the P1 position Fig. (1) . Some of these inhibitors displayed substantial activity against BACE-1 (12-40 nM), in the enzyme assay, but they were found to be inactive in a cell-based assay, likely due to poor permeability. A statine-based central core (I) described in a previous report on potent BACE-1 inhibitors ; and a general illustration of the hydroxyethylene (HE) isostere (II) (with R, X and Y substituents) that was used in this work. Different P1´ residues were incorporated into the HE isostere with the aim to find improved inhibitor interactions. The purpose of the X and Y substituents on the P1 residue was to protrude deeper into the S1 pocket and to extend into the S3 pocket, respectively. In the present work we have further investigated the possibility of improving cell permeability by reducing the polarity of the inhibitors. We also decided to focus on a hydroxyethylene (HE) central core in place of the statine-based isostere. An HE core with an O-methyl P1´ functionality was previously and successfully employed in our laboratories to synthesize potent BACE-1 inhibitors . The reason for this change was that the carboxylic acid functionality of statine-based isosteres, which is a critical feature for high activity for this class, render inhibitors with poor cell-based permeability . Further, the HE isostere contains one less amide linkage compared to the statine core, which decreases the peptidic character of these inhibitors. 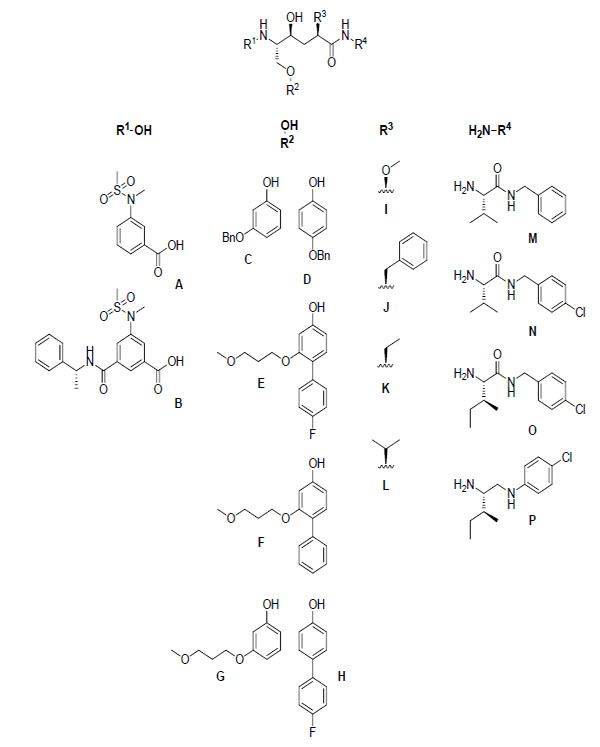 In addition, various substituents at the P1´ position have been evaluated. Based on these observations, the synthesis of a series of hydroxyethylene-based inhibitors containing different P1´ residues and P1 substituents of variable sizes was undertaken. The main objective was to further investigate potential interactions with the S1-S3 binding pocket of BACE-1 Fig. (1). A general structure of the inhibitors that were synthesized, along with the various R substituents used, is illustrated in Fig. (2). A general illustration of the hydroxyethylene central core and the different R substituents that were used. R4 amines M-O were synthesized from commercially available precursors using standard coupling and deprotection procedures (see the experimental section) and amine P was synthesized from commercially available precursors according to a three step protocol (including coupling, reduction and deprotection) (see the experimental section). The phenols C and D were commercially available. 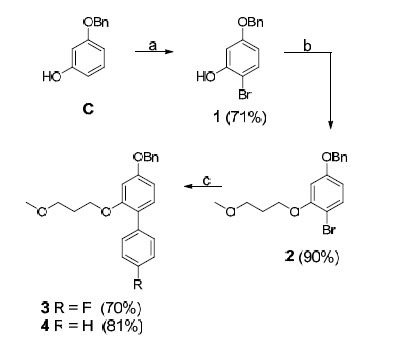 The P1 R2 residues E and F were synthesized from their corresponding benzyl ethers, as shown in Schemes 1 and 3. An electrophilic aromatic substitution on 3-benzyloxy-phenol (C), utilizing N-bromosuccinimide (NBS) in DCM at –15 °C, produced aryl halide 1 in 71% yield (Scheme 1) . Compound 1 was subsequently subjected to Mitsunobu-like conditions using 3-methoxy-1-propanol, PPh3, and DIAD in THF to give compound 2 in 90% yield. We then applied microwave-assisted palladium coupling conditions, which in this case involved treatment of 2 with 4-fluorophenylboronic acid or phenylboronic acid, K3PO4, and PEPPSI™-IPr catalyst in EtOH, H2O, and DMF. Microwave irradiation at 125 °C for 15 min produced biphenyl derivatives 3 and 4 in 70% and 81% yield, respectively. The corresponding benzyl ether of compound G was synthesized from C by applying the same conditions utilized to prepare compound 2, and compound H was obtained from commercially available 4-bromophenol using the same Suzuki protocol employed to synthesize compound 3. Compounds A and B were prepared according to reported procedures [10, 11]. The synthesis of compounds 12a-d is depicted in Scheme 2. 1,2:5,6-Di-O-isopropylidene-a-D-glucofuranose was used as a precursor from which compound 5 was synthesized in 49% yield over five steps using a method described in the literature [12-15]. Treatment of 5 with MeI and Ag2O in DMF furnished the methyl ether 6 in 89% yield. Hydrolysis of 6 using H2SO4 in dioxane gave hemiacetal 7a in 85% yield, and the subsequent oxidation with PDC in DCM produced lactone 8a in 77% yield . Lactone 7b was synthesized according to a literature procedure  and was used as a precursor for synthesizing compounds 8b-d. Stereoselective alkylation at the C2 position of 7b was achieved using LDA, tripyrrolidinophosphine oxide, and EtBr or 2-iodopropane in THF at -68 °C to furnish the alkylated lactones 8b and 8d in 32% and 41% yield, respectively. Compound 8c was produced in 63% yield from 7b using a similar procedure with LDA and BnBr in THF at -78 °C. Next, compounds 8a-d were exposed to catalytic hydrogenolysis to prepare the diols 9a-d in 62-98% yield. Selective primary benzylation  was performed by converting 9a-d into their corresponding tin acetals by reacting the diols with Bu2SnO in refluxing toluene, followed by treatment with tetrabutylammonium bromide and 4-methoxybenzyl bromide to furnish the monobenzyl ethers 10a-d in 70-92% yield over two steps. Employing a Mitsunobu-like protocol with PPh3, DIAD, and DPPA in dry THF provided azides 11a-d in 57-99% yield. Finally, an oxidative removal of the p-methoxybenzyl group using 2,3-dichloro-5,6-dicyano benzoquinone (DDQ) in H2O and DCM, delivered compounds 12a-d in 91-100% yield . Synthesis of compounds 12a-d. Compound 7a was used for the synthesis of 8a, while compound 7b was employed for the synthesis of 8b-d. Reagents and conditions: (a) MeI, Ag2O, DMF; (b) H2SO4, dioxane; (c) PDC, 4 Å molecular sieves; (d) (i) LDA, tripyrrolidinophosphine oxide, EtBr or 2-iodopropane, THF (dry), -68 °C or (ii) LDA, BnBr, THF (dry), -78 °C; (e) (i) H2/Pd(OH)2-C, AcOH, EtOH or (ii) H2/Pd-C, EtOH; (f) Bu2SnO, toluene, reflux; (g) tetrabutylammonium bromide, 4-OMeBnBr, toluene, 90 °C; (h) PPh3, DIAD, DPPA, THF (dry); (i) DDQ, H2O, DCM. Reagents and conditions: (a) triflic anhydride, pyridine (dry), DCM (dry); (b), H2/Pd-C, EtOH; (c) Cs2CO3, 4 Å molecular sieves, DCM (dry), 40 °C; (d) O, 2-hydroxypyridine, DIPEA, DMF, 75 °C; (e) PPh3, MeOH, H2O; (f) A, DIPEA, HATU, DMF. In Scheme 3 the synthesis of target compounds 15 and 16 is presented. Initially, compound 3 was converted to the corresponding phenol by catalytic hydrogenolysis using H2/Pd-C in ethanol. Alcohol 12a was then reacted with Tf2O and pyridine in DCM to yield the corresponding triflate. The phenol and triflate were used without further purification in a substitution reaction, using Cs2CO3 in DCM containing 4 Å molecular sieves, to give compound 13 in 47% yield. It should be noted that we first applied Mitsunobu conditions in an attempt to produce 13. However, the use of this protocol led to significant elimination problems whereas the former approach described above reduced this side reaction considerably. This could be achieved by using fresh Cs2CO3 in dry DCM, and by letting the reaction proceed for a short time at 40 °C under N2 atmosphere. The lactone 13 was opened using amine O and2-hydroxypyridine in DIPEA and DMF at 75 °C, which gave 14 in 83% yield. Reduction using PPh3 in H2O and methanol afforded target compound 15 in 84% yield. Amine 15 was coupled with carboxylic acid A using HATU and DIPEA in DMF to provide target compound 16 (61%). It should be noted that the steps described in Scheme 3 are a representative final route for synthesizing the target compounds. All inhibitors were prepared following this general procedure with some variations, i.e. different phenols were used in step c, opening of the lactone was performed with amines M-P and the final peptide coupling step was only performed in the synthesis of final products 16, 18, 19, 24, and 25 (see the experimental section). Attempts to co-crystallize inhibitor 15 with BACE-1 were performed, but these were not successful. 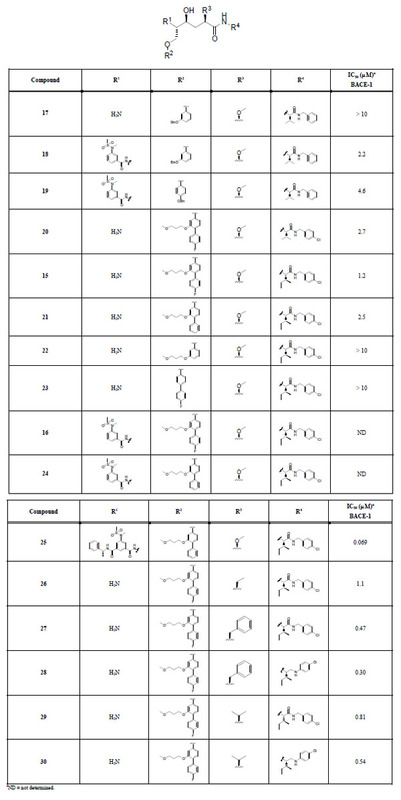 The target compounds are summarized in Table 1. They were synthesized from compounds 12a-d according to Scheme 3 using appropriate R substituentsshown in Fig. (2). Enzyme activities were measured against BACE-1, and the IC50 values are presented in Table 1. In addition, percent inhibition in a cell-based assay was determined at the concentration 1 µM for the four most potent inhibitors (compounds 25, 27, 28, and 30). Target compounds and inhibition data. Initially, m-benzyloxy insertion in the P1 position of the general structure outlined in Table 1 gave the inactive amine 17 and the modestly active sulfonamide 18 (IC50 values > 10 and 2.2 μM, respectively). The P1 p-benzyloxy-modified sulfonamide 19 proved to be nearly equipotent (IC50 4.6 μM) to the corresponding P1 m-benzyloxy compound 18. Nonetheless, the results for 18 and 19 were promising and indicated that more advanced P1 substituents could provide inhibitors with increased activity. Further development led to BACE-1 inhibitors 20 and 15 containing the P1 R2 substituent E and P2´-P3´ R4 substituents N and O Fig. (2) with a p-chloro substituent in the P3´ part of the molecule. Compound 15 has an isoleucine in the P2´ position and an IC50 value of 1.2 μM, making it slightly more active than the corresponding P2´ valine-containing inhibitor 20 (IC50 2.7 μM). In addition, the fluorine substituent on the P1 moiety seems to contribute somewhat to the activity, which can be tentatively concluded when looking at compound 21 (IC50 2.5 μM), lacking the fluorine. The activity of this class of inhibitors most likely depends on interactions from both the para and the meta groups on the P1 substituent, as observed for targets 22 and 23 (IC50 values > 10 μM) lacking the para and the meta substituent, respectively. Notably, 15 is a moderately more potent inhibitor than 18, even though it does not contain a P2 substituent. This can probably be explained by an interaction effect of the more advanced P1 substituent. Unfortunately, introduction of the P2 sulfonamide substituent A into 15 and 21 rendered compounds highly hydrophobic in character, which caused precipitation problems during the activity measurements and thus no inhibition data were obtained for 16 and 24. Compound 25 contains the larger P2-P3 portion B and has a notable IC50 value of 69 nM, which is very intriguing, since it might indicate that the active site possibly can accommodate such a large compound having both the P3 portion and the sizable P1 residue. Further exploration of the P1´ and P3´ positions were done to see if a more drug-like compound could be found, with the P2-P3 substituent excluded. Modification in the P1´ position resulted in compound 26 which proved to be almost equipotent with compound 15. Also, compound 29 proved to be roughly equally potent as 15. Compound 27 has a benzyl group in the P1´ position and an IC50 value of 0.47 μM, making it somewhat more active than inhibitor 15. To investigate if the amide-bond between P2´ and P3´ contributes to biological activity, compounds 28 and 30 were synthesized. Interestingly, 28 and 30 have IC50 values of 0.30 and 0.54 μM, respectively, which are equal to the activities seen for compounds 27 and 29, indicating that the P2´-P3´ amide portion is non-critical for BACE-1 activity in this series of inhibitors. Even though we were able to exclude the P2-P3 portion of the inhibitors and still maintain promising enzyme activities in the nanomolar range, the size and the overall polarity of the compounds unfortunately resulted in poor activities in the cell-based assay with 3%, 19%, 14%, and 28% inhibition of BACE-1 at the concentration 1 μM for the four most active inhibitors 25, 27, 28, and 30, respectively. The fact that compound 25 shows such a low inhibition as 3% can most likely be explained by its size and peptide-like structure. As expected, decreased size and less peptidic character lead to increased inhibition in cells. We have synthesized a series of BACE-1 inhibitors based on a hydroxyethylene core. Although our focus has been on the P1 part of the target molecules, other positions of the inhibitors have also been varied and studied. Enzyme measurements (to give IC50 values) have been performed on the inhibitors and percent inhibition in a cell-based assay was measured for the four most active inhibitors. Various side chain substituents have been employed and the best inhibitor (target 25) displayed an enzyme IC50 of 69 nM. Furthermore, target molecules 27-30 all had IC50 values in the nanomolar range. Interestingly, though they lack a P2 substituent, they still performed well potency-wise. Moreover, compounds 28 and 30 possess only one amide bond, which make them more drug-like when compared with other published inhibitors . The cell-based assays revealed that, as could be foreseen, smaller molecular size and less peptidic character led to increased activity in this regard. Attempts to co-crystallize inhibitor 15 with BACE-1 were done, but were unfortunately unsuccessful. X-ray data could have given us valuable information about interactions between our compounds and BACE-1, which hopefully would have provided us with new ideas on further optimizations. Further research should therefore be aimed at obtaining X-ray structures showing the interactions of our best inhibitors in the active site of BACE-1. NMR-spectra were recorded on a Varian 300 MHz instrument using CDCl3 and CD3OD as solvents. TLC was carried out on Merck precoated 60 F254 plates using UV-light and charring with ethanol/sulfuric acid/p-anisaldehyde/acetic acid 90:3:2:1 or a solution of 0.5% ninhydrin in ethanol for visualization. Flash column chromatography was performed using silica gel 60 (0.040-0.063 mm, Merck). Organic phases were dried over anhydrous magnesium sulfate. Concentrations were performed under diminished pressure at a bath temperature of 40 °C. Optical rotations were measured using a Perkin-Elmer 141 polarimeter. Gradient LC-MS was performed on a Gilson system (column: Phenomenex C-18 250 x 15 mm, 10 µm and Phenomenex C-18 150 x 4.6 mm, 5 µm for preparative and analytical runs, respectively; pump: Gilson gradient pump 322; UV/VIS-detector: Gilson 152; MS detector: Thermo Finnigan Surveyor MSQ; Gilson Fraction Collector FC204) using methanol with 0.1% formic acid and deionized water with 0.1% formic acid as mobile phases. High resolution mass spectra (HRMS) were recorded on a Waters Synapt HDMS instrument equipped with an electrospray interface. The BACE-1 assay was performed as previously described . The inhibition of BACE-1 was determined in a homogeneous time resolved fluorescence (TRF) assay (True Point kit, Perkin-Elmer). The assay buffer contained sodium acetate, CHAPS, Triton-X 100, and EDTA, pH 4.5. The substrate used was the Swedish mutant sequence Eu-EVNLDAEFK-Quencher. The cell-based assay was performed as previously described . Human embryonic kidney 293 cells (HEK-293) stably expressing Swedish mutant APP (swAPP751) were cultured in DMEM supplemented with 10% FCS, PEST (50 U penicillin/50 mg/mL streptomycin) and 200 mg Hygromycin/mL at 37 °C, 5% CO2. After 24 h cell culture media was harvested and analysed by Ab 1–40 ELISA according to the manufacturer instruction (The Genetics Company, Schwitzerland). The results were treated with the curve fitting package in GraphPad Prism 5. Peaks were detected at 254 nm. Column: Phenomenex C-18 150 x 4.6 mm, 5 µm. Gradient: methanol 40-100% over 10 min at 1 mL/min followed by 100% methanol for 5 min. Formic acid (0.1% v/v) was added to all solvents . Peaks were detected at 254 nm. Column: XBridge™ C-18, 4.6 x 50 mm, 2.5 µm. Mobile phase A: 10 mM NH4OAc in 95:5 H2O/ACN; mobile phase B: 10 mM NH4OAc in 90:10 ACN/H2O. Gradient: 30-100% B over 6 min at 1 mL/min followed by 100% B for 3 min. To a cooled (0 °C) solution of the acid (4.95 mmol) in DMF (20 mL) were added the amine (5.44 mmol), DIPEA (14.84 mmol) and HATU (5.94 mmol). The solution was stirred at 0 °C for 0.5 h and for an additional 2 h at room temperature. EtOAc and brine were added and the organic phase was separated and washed once with brine, dried and concentrated. The crude peptide mixture was purified by flash column chromatography. To a solution of the protected compound (0.167 mmol) and triethylsilane (0.419 mmol) in DCM (3 mL) was added TFA (1 mL). The solution was stirred for 2 h at room temperature and then concentrated and co-evaporated with toluene. Synthesis of Building block P.
To a solution of Boc-Ile-OH (1.00 g, 4.32 mmol) in THF (10 mL) cooled to -20˚C under N2-atmosphere N-methyl morpholine (500 μL, 4.55 mmol) was added and the mixture was stirred for 10 minutes. Isobutylchloroformate (590 μL, 4.55 mmol) was added while keeping the temperature below -14˚C. After 20 minutes 4-chloroaniline (520 μL, 4.78 mmol) was added dropwise while keeping the temperature below -20˚C. The reaction mixture was allowed to attain room temperature over five hours before being diluted with toluene and washed with HCl (aq., 2M) and H2O. The organic phase was dried, filtered and evaporated. Purification using flash column chromatography (toluene/EtOAc 19:1) provided the product (1.06 g, 72%) as a white solid. 1H NMR (300 MHz, CDCl3): δ 0.90 (t, J = 7.4 Hz, 3H), 1.00 (d, J = 6.9 Hz, 3H), 1.12-1.28 (m, 1H), 1.42 (s, 9H), 1.55-1.70 (m, 1H), 1.90-2.00 (m, 1H), 4.10 (t, J = 7.9 Hz, 1H), 5.30 (d, J = 6.9 Hz, 1H), 7.15 (d, J = 8.5 Hz, 2H), 7.39 (d, J = 8.8 Hz, 2H), 8.64 (s, 1H); 13C NMR (75.5 MHz, CDCl3): δ 11.2, 15.7, 25.1, 25.1, 28.5, 37.0, 60.2, 80.7, 121.2, 128.9, 129.3, 136.4, 156.6, 170.8. Compound tert-Butyl ((2S,3S)-1-((4-chlorophenyl)amino)-3-methyl-1-oxopentan-2-yl)carbamate (1.00 g, 2.92 mmol) was dissolved in THF/toluene (1:2, 3.3 mL) and cooled to 0˚C under N2-atmosphere. Red-Al (65 wt. % in toluene, 4.70 mL, 15.41 mmol) was added dropwise and the solution was heated to 50˚C. After 24 hours the reaction mixture was cooled to 0˚C and quenched with NaOH (aq., 2 M, 16 mL) during 40 minutes before being diluted with toluene. The organic phase was washed with NaOH (aq., 2 M) and H2O and was then dried, filtered and concentrated. The crude product was purified using flash column chromatography (toluene/EtOAc 9:1) to furnish the product (0.82 g, 85%) as a white solid. 1H NMR (300 MHz, CDCl3): δ 0.88-1.00 (m, 6H), 1.10-1.24 (m, 1H), 1.45 (s, 9H), 1.46-1.64 (m, 2H), 2.85-3.04 (m, 1H), 3.18-3.24 (m, 1H), 3.75 (bs, 1H), 4.14 (bs, 1H), 4.52 (bs, 1H), 6.42-6.51 (m, 2H), 7.03-7.10 (m, 2H); 13C NMR (75.5 MHz, CDCl3): δ 11.6, 15.5, 25.4, 28.4, 37.4, 46.7, 54.7, 79.6, 113.7, 121.6, 129.0, 147.2, 156.7. Boc-protected P (145 mg, 0.44 mmol) was dissolved in dioxane (9 mL) and HCl (conc., 3 mL) was added. The mixture was stirred at room temperature for 15 min and co-evaporated with toluene. Purification using flash column chromatography (MeOH/EtOAc 1:9 + 1% TEA) gave the amine P (98 mg, 98%) as a colorless oil. 1H NMR (300 MHz, CDCl3): δ 0.91-0.96 (m, 6H), 1.16-1.26 (m, 1H), 1.38-1.47 (m, 1H), 1.49-1.60 (m, 1H), 2.75-2.85 (m, 2H), 3.14-3.24 (m, 1H), 6.54 (d, J = 9.0 Hz, 2H), 7.10 (d, J = 9.0 Hz, 2H); 13C NMR (75.5 MHz, CDCl3): δ 11.7, 15.3, 25.3, 40.0, 47.6, 55.1, 114.2, 121.9, 129.1, 147.5. A mixture of 3-benzyloxyphenol (C) (122 mg, 0.609 mmol) in dry DCM (4 mL) was cooled to -15 °C and NBS (109 mg, 0.609 mmol) was added. The solution was stirred at -10 °C for 40 min and for an additional 20 min at room temperature. Concentration and flash column chromatography (DCM/hexanes 7:3) gave 1 (121 mg, 71%) as a colorless oil. [α]D22 -10 (c 0.1, MeOH); 1H NMR (300 MHz, CDCl3) δ 4.97 (s, 2H), 5.53 (bs, 1H), 6.41 (dd, J = 2.7, 8.8 Hz, 1H), 6.65 (d, J = 2.8 Hz, 1H), 7.28 (d, J = 8.8 Hz, 1H), 7.31-7.41 (m, 5H); 13C NMR (75.5 MHz, CDCl3) δ 70.3, 101.3, 102.8, 109.3, 127.5, 128.2, 128.7, 132.1, 136.5, 153.0, 159.7. MS (M+H)+ calcd: 279.0; found: 279.1. To a cooled (0 °C) solution of 1 (680 mg, 2.44 mmol), 3-methoxy-1-propanol (467 μL, 4.87 mmol) and PPh3 (1.28 g, 4.88 mmol) in dry THF (60 mL) DIAD (960 μL, 4.88 mmol) was added. The mixture was then allowed to attain room temperature overnight. Concentration and flash column chromatography (toluene) provided 2 (770 mg, 90%) as a colorless oil. [α]D22 -16 (c 0.1, MeOH); 1H NMR (300 MHz, CDCl3) δ 2.02-2.12 (m, 2H), 3.35 (s, 3H), 3.59 (t, J = 6.1 Hz, 2H), 4.06 (t, J = 6.2 Hz, 2H), 5.00 (s, 2H), 6.44 (dd, J = 2.8, 8.5 Hz, 1H), 6.57 (d, J = 2.8 Hz, 1H), 7.28-7.43 (m, 6H); 13C NMR (75.5 MHz, CDCl3) δ 29.5, 58.9, 65.9, 69.1, 70.4, 101.9, 103.3, 107.1, 127.6, 128.2, 128.7, 133.1, 136.6, 156.5, 159.3. MS calcd (M+Na)+: 373.0; found 373.5. A microwave process vial was charged with 2 (100 mg, 0.285 mmol), 4-fluorophenylboronic acid (80 mg, 0.572 mmol), K3PO4 (150 mg, 0.71 mmol), PEPPSI™-IPr catalyst (10 mg, 0.015 mmol), DMF (2.8 mL), EtOH (1.2 mL), and H2O (0.8 mL). The vial was capped with a Teflon septum and irradiated with microwaves to 125 °C for 15 min. Cooling followed by concentration and flash column chromatography (toluene) gave 3 (73 mg, 70%) as a colorless oil. [α]D22 +9.0 (c 0.1, MeOH); 1H NMR (300 MHz, CDCl3) δ 1.88-1.99 (m, 2H), 3.27 (s, 3H), 3.41 t, J = 6.0 Hz, 2H), 4.00 t, J = 6.0 Hz, 2H), 5.04 (s, 2H), 6.59 (dd, J = 2.5, 8.2 Hz, 1H), 6.64 (d, J = 2.5 Hz, 1H), 7.03 (app. t, JHH= JHF = 8.8 Hz, 2H), 7.16 (d, J = 8.2 Hz, 1H), 7.27-7.48 (m, 7H); 13C NMR (75.5 MHz, CDCl3) δ 29.5, 58.7, 65.2, 69.2, 70.2, 100.8, 105.9, 114.7 (d, JCF = 21.2 Hz, 2C), 123.0, 127.6, 128.1, 128.7, 131.0 (d, JCF = 8.0 Hz, 2C), 131.1, 134.4, 136.9, 156.7, 159.5, 161.7 (d, JCF = 245.1 Hz). MS calcd (M+H)+: 367.2; found 367.0. Compound 4 was synthesized from 2 in 81% yield (colorless oil) according to the method for synthesizing compound 3 using phenylboronic acid instead of 4-fluorophenylboronic acid. [α]D22 +2.0 (c 0.1, MeOH); 1H NMR (300 MHz, CDCl3) δ 1.89-1.99 (m, 2H), 3.27 (s, 3H), 3.42 (t, J = 6.2 Hz, 2H), 4.00 (t, J = 6.2 Hz, 2H), 5.05 (s, 2H), 6.61 (dd, J = 2.3, 8.4 Hz, 1H), 6.65 (d, J = 2.5 Hz, 1H), 7.19-7.29 (m, 2H), 7.30-7.46 (m, 7H), 7.47-7.52 (m, 2H); 13C NMR (75.5 MHz, CDCl3) δ 29.5, 58.7, 65.2, 69.3, 70.2, 100.8, 105.9, 124.0, 126.4, 127.6, 127.9, 128.1, 128.7, 129.6, 131.3, 137.0, 138.5, 156.8, 159.5. MS calcd (M+H)+: 349.2; found 349.0. This compound was synthesized in 86% yield (colorless oil) from 3-benzyloxyphenol (C) according to the preparation method for 2. 1H NMR (300 MHz, CDCl3) δ 1.97-2.07 (m, 2H), 3.34 (m, 3H), 3.53 (t, J = 6.2 Hz, 2H), 4.02 (t, J = 6.2 Hz, 2H), 5.02 (s, 2H), 6.49-6.59 (m, 3H), 7.11-7.19 (m, 2H), 7.29-7.45 (m, 4H); 13C NMR (75.5 MHz, CDCl3) δ 29.7, 58.8, 65.0, 69.4, 70.1, 102.0, 107.2, 107.3, 127.6, 128.0, 128.7, 130.0, 137.2, 160.2, 160.4. Compound H was synthesized in 96% yield (colorless solid) from 4-bromophenol according to the preparation method for 3. 1H NMR (300 MHz, CD3OD) δ 4.92 (bs, 1H), 6.84 (d, J = 8.8 Hz, 2H), 7.03 (app. t, JHH= JHF = 8.9 Hz, 2H), 7.34 (d, J = 8.8 Hz, 2H), 7.44 (dd, J = 5.4, 8.9 Hz, 2H); 13C NMR (75.5 MHz, CD3OD) δ 116.2 (d, JCF = 21.5 Hz, 2C), 116.6, 128.9, 129.0 (d, JCF = 8.0 Hz, 2C), 132.8, 138.6, 158.0, 163.2 (d, JCF = 243.9 Hz). Commercially available 3-amino-benzoic acid methyl ester was used as starting material. The mesylation, methylation and ester hydrolysis steps were performed according to reference . Synthesized according to reference . Compound 5 was synthesized in 49% total yield over five steps according to references [12-15]. Analytical data was in accordance with reference . To a solution of 5 (3.52 g, 9.82 mmol) in DMF (40 mL) MeI (6.10 mL, 98.0 mmol) and Ag2O (4.55 g, 19.6 mmol) were added. The mixture was stirred at room temperature overnight, filtered and concentrated. Flash column chromatography (toluene/EtOAc 15:1) furnished 6 (3.26 g, 89%) as a colorless oil. [α]D22 -60 (c 0.1, MeOH); 1H NMR (300 MHz, CDCl3) δ 2.03-2.20 (m, 2H), 3.35 (s, 3H), 3.37 (s, 3H), 3.63-3.73 (m, 2H), 3.79-3.88 (m, 2H), 4.36-4.46 (m, 1H), 4.59 (d, J = 12.1 Hz, 1H), 4.64 (d, J = 12.1 Hz, 1H), 4.69 (d, J = 11.5 Hz, 1H), 4.84 (d, J = 11.5 Hz, 1H), 4.92 (s, 1H), 7.26-7.44 (m, 10H); 13C NMR (75.5 MHz, CDCl3) δ 32.1, 54.7, 56.8, 71.1, 73.0, 73.4, 79.1, 81.4, 85.0, 107.1, 127.5, 127.5, 127.6, 127.8, 128.3, 128.4, 138.5, 138.8. Compound 6 (2.31 g, 6.20 mmol) was dissolved in dioxane (65 mL) and 0.5 M H2SO4 (58 mL) was added. The solution was refluxed overnight and neutralized with saturated aqueous NaHCO3. The dioxane was evaporated and the residue was dissolved in DCM. Washing with H2O, drying, filtration, concentration and flash column chromatography (toluene/EtOAc 15:1 → toluene/EtOAc 6:1) gave 7a (1.89 g, 85%) as a lightly yellowish oil. [α]D22 -19 (c 0.1, MeOH); 1H NMR (300 MHz, CDCl3) δ 1.86-2.02 (m, 1H), 2.05-2.20 (m, 1H), 3.34 (s, 3H), 3.40 (s, 1H), 3.58 (d, J = 5.2 Hz, 2H), 3.69 (d, J = 4.9 Hz, 1H), 3.85-3.92 (s, 1H), 4.44-4.51 (m, 1H), 4.53 (d, J = 2.2 Hz, 2H), 4.63 (d, J = 11.1 Hz, 1H), 4.79 (d, J = 11.1 Hz, 1H), 5.23 (d, J = 8.2 Hz, 1H), 7.26-7.39 (m, 10H); 13C NMR (75.5 MHz, CDCl3) δ 28.6, 57.1, 70.1, 73.5, 73.8, 79.1, 79.9, 86.3, 100.0, 127.8, 128.0, 128.2, 128.4, 128.7, 128.7, 137.8, 138.1. To a mixture of 7a (1.84 g, 5.13 mmol) in DCM (30 mL) powdered 4 Å molecular sieves and PDC (3.86 g, 10.26 mmol) were added and the mixture was stirred at room temperature overnight. Filtration, concentration and flash column chromatography (toluene/EtOAc 18:1) provided 8a (1.40 g, 77%) as a colorless oil. [α]D22 +7.0 (c 0.1, MeOH); 1H NMR (300 MHz, CDCl3) δ 2.12 (ddd, J = 7.0, 8.2, 13.5 Hz, 1H), 2.55 (ddd, J = 3.6, 8.2, 13.5 Hz, 1H), 3.47-3.61 (m, 2H), 3.51 (s, overlapped, 3H), 3.87 (ddd, J = 3.0, 5.1, 8.1 Hz, 1H), 4.10 (dd, J = 6.9, 8.2 Hz, 1H), 4.49 (d, J = 12.1 Hz, 1H), 4.54 (d, J = 12.1 Hz, 1H), 4.57, (d, J = 11.5 Hz, 1H), 4.65 d, J =11.5 Hz, 1H), 4.75 (ddd, J = 3.0, 3.7, 8.4 Hz, 1H), 7.21-7.40 (m, 10H); 13C NMR (75.5 MHz, CDCl3) δ 29.7, 58.3, 68.8, 73.7, 75.6, 78.1, 78.2, 127.8, 128.1, 128.2, 128.2, 128.6, 137.7, 175.0. MS calcd (M+H)+: 357.1; found 356.5. A solution of the lactone 7b (299 mg, 0.92 mmol) in dry THF (3 mL) was added to a 2 M solution of LDA in THF (0.9 mL, 1.8 mmol) at -68 ºC under N2. The reaction mixture was then treated with tripyrrolidinophosphine oxide (1.4 mL, 6.1 mmol) and EtBr (300 µL, 4.0 mmol). Stirring at -60 ºC was continued for 1 h and the reaction mixture was quenched with aq. NH4Cl. The phases were separated and the aqueous phase was extracted twice with ethyl acetate. The combined organic extracts were dried, filtered and concentrated. The residue was purified using flash column chromatography (toluene/EtOAc 18:1 → toluene/EtOAc 9:1) which provided 8b (104 mg, 32%) as a colorless oil. 1H NMR (300 MHz, CDCl3): δ 0.96 (t, J = 7.5 Hz, 3H), 1.40-1.55 (m, 1H), 1.76-1.93 (m, 2H), 2.36-2.45 (m, 1H), 2.53-2.64 (m, 1H), 3.53-3.63 (m, 2H), 3.81-3.86 (m, 1H), 4.48-4.70 (m, 5H), 7.26-7.39 (m, 10H); 13C NMR (75.5 MHz, CDCl3): δ 11.7, 24.5, 28.1, 40.8, 69.1, 73.6, 73.7, 78.0, 78.6, 127.8, 128.0, 128.1, 128.2, 128.6, 128.7, 137.9, 140.0, 179.7. MS calcd (M+H)+: 355.2; found 354.6. The lactone 7b (155 mg, 0.48 mmol) was dissolved in dry THF (2.5 mL) and cooled to -78 ºC under N2-atm. LDA (2M, 260 µL, 0.52 mmol) was added dropwise. After 15 min the temperature was raised to -50 ºC and benzyl bromide (240 µL, 2.0 mmol) was added dropwise. After 2 h the reaction mixture was allowed to attain room temperature and quenched with saturated NH4Cl (aq). The mixture was extracted with DCM three times. The combined organic layers were dried, filtered and concentrated. Purification with flash column chromatography (toluene/ethyl acetate 19:1) furnished 8c (124 mg, 63%) as a colorless oil. 1H NMR (300 MHz, CDCl3): δ 1.88-1.98 (m, 1H), 2.23-2.32 (m, 1H), 2.73 (dd, J = 9.3, 13.8 Hz, 1H), 2.94-3.05 (m, 1H), 3.17 (dd, J = 4.5, 14.1 Hz, 1H), 3.45-3.57 (m, 2H), 3.79-3.84 (m, 1H), 4.43-4.53 (m, 3H), 4.55-4.66 (m, 2H), 7.14-7.17 (m, 2H), 7.23-7.37 (m, 13H); 13C NMR (75.5 MHz, CDCl3): δ 27.8, 37.1, 41.1, 69.0, 73.6, 73.7, 78.1, 78.5, 126.8, 127.8, 127.9, 128.0, 128.1, 128.6, 128.8, 129.1, 137.9, 138.5, 179.1. Compound 8d was synthesized in 41% yield from 7b using 2-iodopropane instead of EtBr according to the synthesis method for compound 8b. 1H NMR (300 MHz, CDCl3): δ 0.91 (d, J = 6.9 Hz, 3H), 0.99 (d, J = 6.9 Hz, 3H), 1.92-2.03 (m, 1H), 2.08-2.17 (m, 1H), 2.19-2.30 (m, 1H), 2.56-2.63 (m, 1H), 3.55-3.63 (m, 2H), 3.80-3.85 (m, 1H), 4.48-4.55 (m, 2H), 4.56-4.60 (m, 1H), 4.62-4.71 (m, 2H), 7.28-7.39 (m, 10H); 13C NMR (75.5 MHz, CDCl3): δ 18.4, 20.5, 24.2, 29.0, 45.5, 69.1, 73.6, 73.7, 78.0, 78.7, 127.8, 128.0, 128.1, 128.2, 128.6, 137.9, 138.0, 179.0. MS calcd (M+H)+: 369.2 found 368.7. To a solution of 8a (979 mg, 2.75 mmol) in EtOH (95%, 10 mL) and AcOH (1 mL) Pd(OH)2 on active carbon (300 mg) was added. The mixture was hydrogenolyzed (atmospheric pressure) at room temperature overnight. Filtration through Celite, concentration and flash column chromatography (toluene/EtOAc 2:1) yielded 9a (400 mg, 83%) as a colorless oil. [α]D22 +39 (c 0.1, MeOH); 1H NMR (300 MHz, CD3OD) δ 2.15 (ddd, J = 6.9, 8.2, 13.5 Hz, 1H), 2.59 (ddd, J = 3.9, 8.2, 13.5 Hz, 1H), 3.51 (s, 3H), 3.53-3.58 (m, 2H), 3.82 (app. dt, J = 3.6, 5.9 Hz, 1H), 4.22 (d, J = 6.9, 8.2 Hz, 1H), 4.68 (app. dt, J = 3.8, 8.2 Hz, 1H); 13C NMR (75.5 MHz, CD3OD) δ 30.1, 58.4, 63.6, 73.3, 77.0, 80.1, 177.3. A solution of 8b (86 mg, 0.24 mmol) in EtOH (2 mL, 95%) was hydrogenolyzed using H2/Pd-C (1 atm.) for 4 h. The suspension was filtered through Celite and concentrated to give 9b (41 mg, 98%) as a colorless oil. 1H NMR (300 MHz, CDCl3): δ 1.00 (t, J = 7.5 Hz, 3H), 1.44-1.57 (m, 1H), 1.77-1.89 (m, 1H), 1.91-2.02 (m, 1H), 2.42-2.51 (m, 1H), 2.59-2.70 (m, 1H), 3.60-3.66 (m, 1H), 3.72-3.77 (m, 1H), 3.82-3.89 (m, 1H), 4.45-4.51 (m, 1H); 13C NMR (75.5 MHz, CDCl3): δ 11.7, 24.4, 28.4, 40.8, 63.2, 72.6, 78.3, 180.1. Compound 9c was synthesized from 8c according to the synthesis method for compound 9b. Purification using flash column chromatography (methanol/EtOAc 1:34) gave 9c in 84% yield as a colorless oil. 1H NMR (300 MHz, CDCl3): δ 1.97-2.07 (m, 1H), 2.30-2.39 (m, 1H), 2.77 (dd, J = 9.0, 13.8 Hz, 1H), 2.98-3.08 (m, 1H), 3.18 (dd, J = 4.5, 13.8 Hz, 1H), 3.55-3.60 (m, 1H), 3.67-3.71 (m, 1H), 3.80-3.84 (m, 1H), 4.27-4.33 (m, 1H), 7.18-7.22 (m, 2H), 7.23-7.34 (m 3H); 13C NMR (75.5 MHz, CDCl3): δ 28.2, 37.0, 41.0, 61.2, 73.6, 77.9, 79.8, 126.9, 128.1, 128.3, 128.7, 128.8, 129.0, 137.6, 138.3, 178.9. MS calcd (M+H)+: 237.1; found 236.8. Compound 9d was synthesized from 8d according to the synthesis method for compound 9b. Purification using flash column chromatography (EtOAc) gave 9d (62%) as a colorless oil. 1H NMR (300 MHz, CDCl3): δ 0.94 (d, J = 6.9 Hz, 3H), 1.03 (d, J = 6.9 Hz, 3H), 2.04-2.18 (m, 2H), 2.29-2.39 (m, 1H), 2.60-2.68 (m, 1H), 3.64-3.68 (m, 1H), 3.75-3.84 (m, 2H), 4.40-4.46 (m, 1H); 13C NMR (75.5 MHz, CDCl3): δ 18.6, 20.5, 25.0, 29.1, 45.4, 63.2, 72.7, 78.2, 179.1. Compound 9a (163 mg, 0.93 mmol) and Bu2SnO (299 mg, 1.20 mmol) were added to toluene (6 mL) and the mixture was refluxed for 4 h. The temperature was lowered to 90 °C and tetrabutylammonium bromide (343 mg, 1.06 mmol) and 4-methoxybenzyl bromide (153 μL, 1.06 mmol) were added and the mixture was stirred overnight at 90 °C. Concentration and flash column chromatography (toluene/EtOAc 6:1) provided 10a (246 mg, 90%) as a colorless oil. [α]D22 +18 (c 0.1, MeOH); 1H NMR (300 MHz, CDCl3) δ 2.17 (ddd, J = 6.0, 7.8, 13.7 Hz, 1H), 2.51 (ddd, J = 4.8, 8.0, 13.7 Hz, 1H), 2.63-2.68 (b, 1H), 3.43-3.57 (m, 2H), 3.53 (s, overlapped, 3H), 3.81 (s, 3H), 3.88-3.98 (m, 1H), 4.09 (dd, J = 6.0, 8.0 Hz, 1H), 4.45 (d, J = 11.5 Hz, 1H), 4.49 (d, J = 11.5 Hz, 1H), 4.54-4.62 (m, 1H), 6.88 (d, J = 8.8 Hz, 2H), 7.23 (d, J = 8.8 Hz, 2H); 13C NMR (75.5 MHz, CDCl3) δ 30.3, 55.4, 58.3, 70.1, 71.0, 73.4, 75.5, 78.1, 114.1, 129.6, 159.6, 174.7. Compound 10b (colorless oil) was synthesized in 70% yield from 9b according to the synthesis method for compound 10a. 1H NMR (300 MHz, CDCl3): δ 0.98 (t, J = 7.5 Hz, 3H), 1.42-1.57 (m, 1H), 1.77-1.87 (m, 1H), 1.88-1.98 (m, 1H), 2.39-2.48 (m, 1H), 2.54-2.61 (m, 1H), 3.50 (dd, J = 6.0, 9.9 Hz, 1H), 3.58 (dd, J = 4.2, 9.9 Hz, 1H), 3.80 (s, 3H), 3.83-3.86 (m, 1H), 4.40-4.45 (m, 1H), 4.47 (d, J = 2.7 Hz, 2H), 6.85-6.90 (m, 2H), 7.21-7.26 (m, 2H); 13C NMR (75.5 MHz, CDCl3) δ 11.7, 24.3, 28.6, 40.4, 55.4, 70.3, 71.2, 73.4, 77.8, 114.1, 129.6, 129.7, 159.6, 179.5. Compound 10c (colorless oil) was synthesized in 88% yield from 9c according to the synthesis method for compound 10a. 1H NMR (300 MHz, CDCl3): δ 1.93-2.03 (m, 1H), 2.27-2.36 (m, 1H), 2.75 (dd, J = 9.3, 13.8 Hz, 1H), 2.95-3.05 (m, 1H), 3.18 (dd, J = 4.5, 13.8 Hz, 1H), 3.42-4.54 (m, 2H), 3.80 (s, 3H), 3.81-3.86 (m, 1H), 4.28-4.34 (m, 1H), 4.42 (d, J = 11.4 Hz, 1H), 4.47 (d, J = 11.4 Hz, 1H), 6.85-6.90 (m, 2H), 7.18-7.35 (m, 7H); 13C NMR (75.5 MHz, CDCl3): δ 28.2, 36.8, 40.8, 55.4, 70.2, 71.1, 73.3, 78.0, 114.0, 126.9, 128.8, 128.9, 129.0, 129.6, 129.7, 138.3, 159.6, 178.9. MS calcd (M+Na)+: 379.2; found 379.6. Compound 10d (colorless oil) was synthesized in 92% yield from 9d according to the synthesis method for compound 10a. 1H NMR (300 MHz, CDCl3): δ 0.90 (d, J = 6.6 Hz, 3H), 0.98 (d, J = 6.9 Hz, 3H), 1.94-2.04 (m, 1H), 2.05-2.16 (m, 1H), 2.22-2.32 (m, 1H), 2.54-2.62 (m, 1H), 3.45-3.56 (m, 2H), 3.77 (s, 3H), 3.81-3.88 (m, 1H), 4.36-4.42 (m, 1H), 4.45 (d, J = 3.6 Hz, 2H), 6.83-6.88 (m, 2H), 7.20-7.24 (m, 2H); 13C NMR (75.5 MHz, CDCl3): δ 18.5, 20.5, 24.9, 28.9, 45.1, 55.4, 70.3, 71.3, 73.4, 77.9, 114.1, 128.7, 129.6, 159.6, 178.9. Compound 10a (53 mg, 0.18 mmol) and PPh3 (68 mg, 0.26 mmol) were dissolved in dry THF (2.5 mL). The mixture was cooled to –15 °C and DIAD (81 μL, 0.41 mmol) was added. After stirring for 10 min at –15 °C the temperature was raised to 0 °C and DPPA (60 μL, 0.28 mmol) was added. The solution was stirred for 30 min at 0 °C and then overnight at room temperature. Concentration and flash column chromatography (toluene/EtOAc 15:1) gave 11a (57 mg, 99%) as a colorless oil. [α]D22 +92 (c 0.1, MeOH); 1H NMR (300 MHz, CDCl3) δ 2.24 (ddd, J = 5.8, 8.0, 13.7 Hz, 1H), 2.35-2.46 (m, 1H), 3.54 (s, 3H), 3.60-3.67 (m, 1H), 3.69-3.74 (m, 2H), 3.80 (s, 3H), 4.13 (dd, J = 5.8, 8.0 Hz, 1H), 4.50 (s, 2H), 4.66 (ddd, J = 3.0, 5.0, 8.0 Hz, 1H), 6.88 (d, J = 8.7 Hz, 2H), 7.25 (d, J = 8.7 Hz, 2H); 13C NMR (75.5 MHz, CDCl3) δ 32.4, 55.4, 58.4, 63.5, 69.4, 73.5, 74.9, 76.3, 114.1, 129.4, 129.6, 159.6, 174.0. Compound 11b (colorless oil) was synthesized in 73% yield from 10b according to the synthesis method for compound 11a. 1H NMR (300 MHz, CDCl3) δ 0.99 (t, J = 7.5 Hz, 3H), 1.43-1.60 (m, 1H), 1.78-1.89 (m, 1H), 1.97-2.06 (m, 1H), 2.25-2.34 (m, 1H), 2.65-2.76 (m, 1H), 3.59-3.65 (m, 1H), 3.69-3.73 (m, 2H), 3.81 (s, 3H), 4.50 (s, 2H), 4.53-4.59 (m, 1H), 6.86-6.91 (m, 2H), 7.23-7.28 (m, 2H); 13C NMR (75.5 MHz, CDCl3): δ 11.6, 24.5, 30.3, 40.3, 55.4, 64.2, 69.5, 73.5, 76.3, 114.1, 129.5, 129.6, 159.6, 178.8. Compound 11c (colorless oil) was synthesized in 74% yield from 10c according to the synthesis method for compound 11a. (The temperature was 0 °C instead of –15 °C.) 1H NMR (300 MHz, CDCl3): δ 2.02-2.22 (m, 2H), 2.72-2.79 (m, 1H), 3.06-3.14 (m, 1H), 3.16-3.22 (m, 1H), 3.54-3.59 (m, 1H), 3.68 (s, 1H), 3.70 (d, J = 2.4 Hz, 1H), 3.81 (s, 3H), 4.30-4.43 (m, 1H), 4.48 (s, 2H), 6.86-6.91 (m, 2H), 7.18-7.35 (m, 7H); 13C NMR (75.5 MHz, CDCl3): δ 29.9, 36.9, 40.6, 55.4, 64.0, 69.5, 73.5, 76.3, 114.0, 127.0, 128.9, 129.0, 129.5, 129.6, 138.1, 159.6, 178.2. Compound 11d (colorless oil) was synthesized in 57% yield from 10d according to the synthesis method for compound 11c. 1H NMR (300 MHz, CDCl3): δ 0.91 (d, J = 6.9 Hz, 3H), 1.00 (d, J = 6.9 Hz, 3H), 2.08-2.19 (m, 3H), 2.65-2.73 (m, 1H), 3.58-3.63 (m, 1H), 3.70-3.72 (m, 2H), 3.79 (s, 3H), 4.49 (s, overlapped, 2H), 4.48-4.53 (m, 1H), 6.87-6.90 (m, 2H), 7.23-7.28 (m, 2H); 13C NMR (75.5 MHz, CDCl3): δ 18.3, 20.3, 26.6, 29.0, 44.9, 55.3, 64.2, 69.4, 73.4, 76.3, 114.0, 129.5, 159.5, 178.1. To a solution of 11a (321 mg, 1.00 mmol) in DCM (5 mL) and H2O (0.25 mL) DDQ (250 mg, 1.10 mmol) was added. The mixture was stirred overnight at room temperature and concentrated. Flash column chromatography (toluene/EtOAc 2:1) furnished 12a (194 mg, 97%) as a colorless oil. [α]D22 +95 (c 0.1, MeOH); 1H NMR (300 MHz, CDCl3) δ 2.30 (ddd, J = 5.8, 7.7, 13.7 Hz, 1H), 2.43 (ddd, J = 4.9, 8.0, 13.7 Hz, 1H), 2.87 (bs, 1H), 3.53 (s, 3H), 3.60 (dt, J = 3.0, 6.3 Hz, 1H), 3.87 (d, J = 6.3 Hz, 1H), 4.16 (dd, J = 5.8, 8.0 Hz, 2H), 4.74 (ddd, J = 3.6, 5.5, 7.7 Hz, 1H); 13C NMR (75.5 MHz, CDCl3) δ 32.5, 58.6, 62.4, 65.5, 75.1, 76.8, 174.6. Compound 12b (colorless oil) was synthesized in 94% yield from 11b according to the synthesis method for compound 12a. 1H NMR (300 MHz, CD3OD): δ 1.01 (t, J = 7.5 Hz, 3H), 1.45-1.60 (m, 1H), 1.74-1.87 (m, 1H), 2.09-2.18 (m, 1H), 2.32-2.41 (m, 1H), 2.67-2.77 (m, 1H), 3.57-3.63 (m, 1H), 3.71-3.83 (m, 2H), 4.61-4.67 (m, 1H); 13C NMR (75.5 MHz, CD3OD): δ 11.7, 25.4, 31.2, 41.7, 62.9, 67.8, 78.5, 181.3. MS calcd (M+H)+: 200.1; found 199.5. Compound 12c (colorless oil) was synthesized in 91% yield from 11c according to the synthesis method for compound 12a. 1H NMR (300 MHz, CDCl3): δ 2.12-2.20 (m, 2H), 2.75-2.82 (m, 1H), 3.07-3.14 (m, 1H), 3.17-3.22 (m, 1H), 3.49-3.54 (m, 1H), 3.84 (d, J = 5.7 Hz, 2H), 4.41-4.47 (m, 1H), 7.18-7.23 (m, 2H), 7.25-7.35 (m, 3H); 13C NMR (75.5 MHz, CDCl3): δ 30.0, 36.9, 40.7, 62.5, 65.9, 76.6, 127.1, 129.0, 129.1, 138.0, 178.2. MS calcd (M+Na)+: 284.1; found 283.6. Compound 12d (yellow powder) was synthesized in quantitative yield from 11d according to the synthesis method for compound 12a. 1H NMR (300 MHz, CD3OD): δ 0.94 (d, J = 6.9 Hz, 3H), 1.03 (d, J = 6.6 Hz, 3H), 2.04-2.15 (m, 1H), 2.21-2.26 (m, 2H), 2.70-2.77 (m, 1H), 3.56-3.62 (m, 1H), 3.71-3.83 (m, 2H), 4.57-4.63 (m, 1H); 13C NMR (75.5 MHz, CD3OD): δ 18.7, 20.4, 27.7, 30.3, 46.4, 62.9, 67.9, 78.5, 180.6. To a solution of 3 (121 mg, 0.330 mmol) in EtOH (95%, 4 mL) was added Pd-C (10%, 60 mg) and the mixture was hydrogenolyzed (atmospheric pressure) at room temperature for 3h. The suspension was filtered through Celite and concentrated. The resulting phenol was used without any further purification in the following step. To a cooled (0 °C) solution of 12a (60 mg, 0.298 mmol) and dry pyridine (46 μL, 0.571 mmol) in dry DCM (3 mL) was added Tf2O (84 μL, 0.498 mmol) and the mixture was stirred at 0 °C for 45 min. The reaction was quenched with saturated aqueous NH4Cl and the organic phase was separated, dried, filtered and concentrated. The phenol and the triflate (obtained from the general procedures A and B, respectively) were dissolved in dry DCM (3 mL) and stirred together with 4 Å powdered molecular sieves (50 mg) for 10 min before the addition of Cs2CO3 (215 mg, 0.66 mmol). The mixture was heated to 40 °C and stirred for 1.5 h under N2 atmosphere, filtered, and concentrated. Purification using LC-MS gave colorless semicrystalline 13 (64 mg, 47%). [α]D22 +115 (c 0.1, MeOH); 1H NMR (300 MHz, CDCl3) δ 1.92-2.02 (m, 2H), 2.30-2.41 (m, 1H), 2.48-2.59 (m, 1H), 3.30 (s, 3H), 3.44 (t, J = 6.3 Hz, 2H), 3.58 (s, 3H), 3.92 (dt, J = 2.8, 6.2 Hz, 1H), 4.03 (t, J = 6.3 Hz, 2H), 4.19 (dd, J = 6.1, 8.0 Hz, 1H), 4.29 (d, J = 6.3 Hz, 2H), 4.77-4.84 (m, 1H), 6.53-6.60 (m, 2H), 7.05 (app. t, JHH= JHF = 8.8 Hz, 2H), 7.20 (d, J = 8.5 Hz, 1H), 7.43 (dd, JHF= 5.5, JHH 8.8 Hz, 2H); 13C NMR (75.5 MHz, CDCl3) δ 29.5, 32.5, 58.5, 58.8, 63.0, 65.5, 68.1, 69.2, 74.9, 76.1, 100.6, 105.9, 114.8 (d, JCF = 21.2 Hz, 2C), 124.0, 131.1 (d, JCF = 8.0 Hz, 2C), 131.3, 134.2, 157.0, 158.5, 161.9 (d, JCF = 245.1 Hz), 173.8. MS calcd (M+H)+: 460.2; found 460.1. 2-Hydroxypyridine (20 mg, 0.210 mmol) was added to a solution of 13 (28 mg, 0.061 mmol) and amine O (40 mg, 0.157 mmol) in DIPEA (4 mL) and DMF (0.5 mL). The mixture was stirred at 75 °C under N2 atmosphere overnight. Concentration and purification using LC-MS gave 14 (36 mg, 83%) as a colorless solid. [α]D22 +15 (c 0.1, MeOH); 1H NMR (300 MHz, CDCl3) δ 0.88-1.00 (m, 6H), 1.03-1.19 (m, 1H), 1.41-1.56 (m, 1H), 1.91-2.03 (m, 3H), 2.07-2.23 (m, 2H), 2.90 (bs, 1H), 3.29 (s, 3H), 3.43 (t, overlapped, J = 6.1 Hz, 2H), 3.46 (s, 3H), 3.64-3.72 (m, 1H), 3.87 (dd, J = 4.1, 5.5 Hz, 1H), 4.02 (t, J = 6.2 Hz, 2H), 4.06-4.22 (m, 3H), 4.29-4.38 (m, 3H), 6.52 (dd, J = 2.5, 8.2 Hz, 1H), 6.57 (d, J = 2.2 Hz, 1H), 7.00-7.10 (m, 3H), 7.14-7.28 (m, 6H), 7.44 (dd, JHF= 5.5, JHH 8.8 Hz, 2H); 13C NMR (75.5 MHz, CDCl3) δ 11.6, 16.2, 24.8, 29.5, 35.6, 36.4, 42.9, 57.8, 58.5, 58.8, 65.0, 65.5, 67.4, 68.3, 69.2, 79.5, 100.8, 105.7, 114.8 (d, JCF = 21.2 Hz, 2C), 123.7, 128.9, 129.3, 131.1 (d, JCF = 8.0 Hz, 2C), 131.2, 133.4, 134.3, 137.0, 156.9, 158.9, 161.9 (d, JCF = 245.4 Hz), 171.1, 172.5. MS calcd (M+H)+: 714.3; found 714.2. To a solution of 14 (31 mg, 0.043 mmol) in MeOH (4 mL), THF (1 mL), and a few drops of water was added PPh3 (28 mg, 0.107 mmol) and the mixture was stirred at room temperature overnight. Concentration and flash column chromatography (EtOAc/MeOH 9:1 + 1% TEA) gave 15 (25 mg, 84%) as a colorless solid. [α]D22 +4.0 (c 0.1, MeOH); 1H NMR (300 MHz, CDCl3) δ 0.88-1.00 (m, 6H), 1.04-1.19 (m, 1H), 1.41-1.55 (m, 1H), 1.90-2.01 (m, 3H), 2.06-2.19 m, 1H), 2.20-2.31 m, 1H), 2.47 (bs, 2H), 2.99-3.08 (m, 1H), 3.29 (s, 3H), 3.43 (t, overlapped, J = 6.0 Hz, 2H), 3.45 (s, 3H), 3.77-3.92 (m, 3H), 3.94-4.00 (m, 1H), 4.02 (t, overlapped, J = 6.3 Hz, 2H), 4.32-4.37 (m, 2H), 4.38-4.45 (m, 1H), 6.50 (dd, J = 2.3, 8.4 Hz, 1H), 6.55 (d, J = 2.3 Hz, 1H), 6.97 (d, J = 9.1 Hz, 1H), 7.05 (app. t, JHH= JHF = 8.8 Hz, 2H), 7.14-7.28 (m, 5H), 7.43 (dd, JHF= 5.5, JHH = 9.1 Hz, 2H), 7.57-7.66 (b, 1H); 13C NMR (75.5 MHz, CDCl3) δ 11.9, 16.3, 24.7, 29.6, 35.8, 36.0, 42.9, 54.7, 57.8, 58.4, 58.8, 65.5, 66.6, 69.2, 70.1, 79.6, 100.6, 105.8, 114.8 (d, JCF = 21.2 Hz, 2C), 123.4, 128.8, 129.4, 131.0 (d, JCF = 8.0 Hz, 2C), 131.2, 133.1, 134.3, 137.2, 156.9, 159.3, 161.8 (d, JCF = 245.1 Hz), 171.1, 172.8. HRMS calcd (M+H)+: 688.3165; found 688.3197. LC-MS Purity System A: tR = 6.72 min, 100%; System B: tR = 5.71 min, 98%. To a cooled (0 °C) solution of acid A (5.0 mg, 0.022 mmol), amine 15 (17 mg, 0.025 mmol) and DIPEA (12 μL, 0.069 mmol) in DMF (1 mL) was added HATU (10 mg, 0.026 mmol). The solution was stirred for 0.5 h at 0 °C and for an additional 2 h at room temperature. EtOAc and brine were added and the organic phase was separated and washed once with brine, dried and concentrated. Purification using LC-MS gave 16 (12 mg, 61%) as a colorless solid. [α]D22 -7.0 (c 0.1, MeOH); 1H NMR (300 MHz, CDCl3) δ 0.88-0.98 (m, 6H), 1.04-1.20 (m, 1H), 1.41-1.56 (m, 1H), 1.81 (bs, 1H), 1.90-2.01 (m, 2H), 2.02-2.11 (m, 2H), 2.12-2.24 (m, 1H), 2.85 (s, 3H), 3.28 (s, 3H), 3.35 (s, 3H), 3.43 (t, overlapped, J = 6.2 Hz, 2H), 3.46 (s, 3H), 3.86-3.92 (m, 1H), 4.02 (t, J = 6.2 Hz, 2H), 4.12-4.21 (m, 2H), 4.25-4.43 (m, 5H), 6.56-6.62 (m, 2H), 6.90-6.99 (m, 2H), 7.01-7.10 (m, 3H), 7.12-7.23 (m, 5H), 7.39-7.50 (m, 3H), 7.53-7.58 (b, 1H), 7.67-7.72 (b, 1H), 7.86 (s, 1H), 13C NMR (75.5 MHz, CDCl3) δ 11.6, 16.1, 24.9, 29.6, 35.7, 35.8, 36.6, 38.2, 43.0, 53.7, 57.9, 58.5, 58.8, 65.5, 66.7, 67.3, 69.3, 79.8, 100.1, 106.1, 114.8 (d, JCF = 21.2 Hz, 2C), 123.5, 125.0, 125.9, 128.9, 129.3, 129.8, 131.1 (d, JCF = 7.7 Hz, 2C), 131.3, 133.4, 134.6, 135.5, 136.8, 142.1, 157.0, 159.1, 161.9 (d, JCF = 245.1 Hz), 167.1, 171.2, 172.8. HRMS calcd (M+H)+: 899.3468; found 899.3486. LC-MS Purity System A: tR = 10.49 min, 98%; System B: tR = 6.61 min, 97%. Compound 17 (colorless solid) was synthesized from 12a according to the general procedures B-D using phenol C and amine M. [α]D22 -2.0 (c 0.1, MeOH); 1H NMR (300 MHz, CD3OD) δ 0.93 (d, J = 6.9 Hz, 3H), 0.95 (d, J = 6.9 Hz, 3H), 1.90-2.02 (m, 2H), 2.14-2.26 (m, 1H), 2.91-3.00 (m, 1H), 3.38 (s, 3H), 3.79-3.99 (m, 4H), 4.24 (d, J = 6.6 Hz, 1H), 4.31 (d, J = 14.8 Hz, 1H), 4.37 (d, J = 14.8 Hz, 1H), 5.01 (s, 2H), 6.48-6.60 (m, 3H), 7.10-7.43 (m, 11H); 13C NMR (75.5 MHz, CD3OD) δ 18.2, 19.8, 31.3, 36.9, 43.9, 55.0, 58.5, 59.1, 68.3, 70.3, 70.7, 80.3, 102.8, 107.9, 108.1, 127.9, 128.1, 128.3, 128.5, 129.1, 130.6, 137.9, 139.0, 160.7, 160.9, 172.6, 174.4. HRMS calcd (M+H)++: 564.3074; found 564.3074. LC-MS Purity System A: tR = 4.18 min, 100%; System B: tR = 2.29 min, 98%. Compound 18 (colorless solid) was synthesized from 17 according to the general procedure E. [α]D22 -10 (c 0.1, MeOH); 1H NMR (300 MHz, CD3OD) δ 0.86-0.96 (m, 6H), 1.91-2.01 (m, 2H), 2.03-2.17 (m, 1H), 2.89 (s, 3H), 3.31 (s, 3H), 3.36 (s, 3H), 3.92-3.99 (m, 1H), 4.09-4.29 (m, 4H), 4.34 (s, 2H), 4.51 (dt, J = 2.5, 6.6 Hz, 1H), 5.02 (s, 2H), 6.53-6.63 (s, 3H), 7.11-7.22 (m, 2H), 7.23-7.43 (m, 9H), 7.48 (t, J = 8.0 Hz, 1H), 7.60 (d, J = 8.0 Hz, 1H), 7.78 (d, J = 8.0 Hz, 1H), 7.90 (s, 1H); 13C NMR (75.5 MHz, CD3OD) δ 18.6, 19.8, 31.9, 35.7, 38.0, 38.5, 44.1, 54.2, 58.6, 59.9, 67.7, 68.0, 71.0, 80.5, 103.2, 108.4, 108.7, 126.5, 127.3, 128.3, 128.6, 128.6, 128.8, 129.5, 129.5, 130.5, 131.0, 131.1, 136.8, 138.7, 139.7, 143.5, 161.3, 161.5, 169.8, 173.3, 175.0. HRMS calcd (M+H)+: 775.3377; found 775.3391. LC-MS Purity System A: tR = 9.77 min, 95%; System B: tR = 5.74 min, 99%. Compound 19 (colorless solid) was synthesized from 12a according to the general procedures B-E using phenol D and amine M. [α]D22 +4.0 (c 0.1, MeOH); 1H NMR (300 MHz, CD3OD) δ 0.88 (d, J = 6.9 Hz, 3H), 0.91 (d, J = 6.9 Hz, 3H), 1.91-1.99 (m, 2H), 2.03-2.17 (m, 1H), 2.90 (s, 3H), 3.32 (s, 3H), 3.36 (s, 3H), 3.90-3.98 (m, 1H), 4.06-4.28 (m, 4H), 4.34 (s, 2H), 4.48 (dt, J = 2.5, 6.6 Hz, 1H), 5.00 (s, 2H), 6.89 (app. s, 3H), 7.09-7.43 (m, 11H), 7.49 (t, J = 7.8 Hz, 1H), 7.61 (d, J = 8.0 Hz, 1H), 7.78 (d, J = 8.0 Hz, 1H), 7.89 (s, 1H); 13C NMR (75.5 MHz, CD3OD) δ 18.6, 19.8, 31.9, 35.7, 38.1, 38.5, 44.1, 54.2, 58.6, 59.9, 67.7, 68.7, 71.6, 80.5, 116.9, 117.0, 126.5, 127.3, 128.3, 128.5, 128.6, 128.8, 129.4, 129.5, 130.4, 131.1, 136.8, 139.0, 139.7, 143.5, 154.4, 154.7, 169.8, 173.3, 175.0. HRMS calcd (M+H)+: 775.3377; found 775.3390. LC-MS Purity System A: tR = 9.58 min, 96%; System B: tR = 5.66 min, 97%. Compound 20 (colorless solid) was synthesized from 12a according to the general procedures A-D using amine N. [α]D22 +2.0 (c 0.1, MeOH); 1H NMR (300 MHz, CDCl3) δ 0.92 (d, J = 6.9 Hz, 3H), 0.99 (d, J = 7.1 Hz, 3H), 1.89-2.02 (m, 4H), 2.03-2.19 (m, 2H), 2.49-2.63 (m, 1H), 2.96-3.03 (m, 1H), 3.29 (s, 3H), 3.43 (t, overlapped, J = 6.2 Hz, 2H), 3.46 (s, 3H), 3.75-3.84 (m, 2H), 3.86-3.98 (m, 2H), 4.02 (t, J = 6.3 Hz, 2H), 4.32-4.41 (m, 3H), 6.50 (dd, J = 2.3, 8.4 Hz, 1H), 6.55 (d, J = 2.3 Hz, 1H), 6.94 (d, J = 8.8 Hz, 1H), 7.05 (app. t, JHH= JHF = 8.8 Hz, 2H), 7.15-7.29 (m, 5H), 7.44 (dd, JHF= 5.5, JHH 8.5 Hz, 2H), 7.54-7.62 (b, 1H); 13C NMR (75.5 MHz, CDCl3) δ 17.3, 19.8, 29.4, 29.6, 35.8, 42.9, 54.7, 58.0, 58.5, 58.8, 65.5, 66.6, 69.2, 70.1, 79.6, 100.7, 105.8, 114.8 (d, JCF = 21.2 Hz, 2C), 123.5, 128.8, 129.4, 131.1 (d, JCF = 8.0 Hz, 2C), 131.3, 133.2, 134.3, 137.2, 156.9, 159.3, 161.9 (d, JCF = 245.4 Hz), 171.1, 172.9. HRMS calcd (M+H)+: 674.3008; found 674.3030. LC-MS Purity System A: tR = 6.31 min, 100%; System B: tR = 5.25 min, 98%. Compound 21 (colorless solid) was synthesized from 12a according to the general procedures A-D using compound 4. [α]D22 +12 (c 0.1, MeOH); 1H NMR (300 MHz, CDCl3) δ 0.91-0.99 (m, 6H), 1.02-1.20 (m, 1H), 1.40-1.55 (m, 1H), 1.89-2.02 (4H), 2.03-2.18 (m, 2H), 2.22-2.37 (m, 1H), 2.94-3.03 (m, 1H), 3.29 (s, 3H), 3.45 (t, overlapped, J = 6.2 Hz, 2H), 3.46 (s, 3H), 3.75-3.83 (m, 2H), 3.86-3.91 (m, 1H), 3.92-3.98 (m, 1H), 4.02 (t, J = 6.2 Hz, 2H), 4.33-4.37 (m, 1H), 4.38-4.44 (m, 2H), 6.51 (dd, J = 2.3, 8.4 Hz, 1H), 6.56 (d, J = 2.3 Hz, 1H), 6.92 (d, J = 8.8 Hz, 1H), 7.15-7.31 (m, 6H), 7.32-7.40 (m, 2H), 7.45-7.51 (m, 2H), 7.52-7.61 (b, 1H); 13C NMR (75.5 MHz, CDCl3) δ 12.0, 16.4, 24.7, 30.0, 35.7, 36.0, 43.0, 54.7, 57.9, 58.5, 58.8, 65.5, 66.5, 69.3, 70.1, 79.6, 100.7, 105.8, 124.6, 126.6, 128.0, 128.8, 129.4, 129.6, 131.4, 133.2, 137.2, 138.4, 157.0, 159.2, 171.1, 172.8. HRMS calcd (M+H)+: 670.3259; found 670.3284. LC-MS Purity System A: tR = 6.55 min, 98%; System B: tR = 5.62 min, 100%. Compound 22 (colorless solid) was synthesized from 12a according to the general procedures A-D using 1-benzyloxy-3-(3-methoxy-propoxy)-benzene(benzylated G). [α]D22 +9.0 (c 0.1, MeOH); 1H NMR (300 MHz, CDCl3) δ 0.88-0.98 (m, 6H), 1.01-1.18 (m, 1H), 1.39-1.54 (m, 1H), 1.88-2.16 (m, 4H), 2.17-2.38 (m, 4H), 2.95-3.02 (m, 1H), 3,47 (s, 3H), 3.43 (s, 3H), 3.55 (t, J = 6.2 Hz, 2H), 3.72-3.83 (m, 2H), 3.83-3.95 (m, 2H), 4.03 (t, J = 6.3 Hz, 2H), 4.34 (dd, J = 2.5, 5.8 Hz, 2H), 4.40 (dd, J = 4.5, 8.9 Hz, 1H), 6.43-6.50 (m, 2H), 6.53 (dd, J = 2.2, 8.2 Hz, 1H), 6.94 (d, J = 8.8 Hz, 1H), 7.12-7.29 (m, 5H), 7.61-7.69 (b, 1H); 13C NMR (75.5 MHz, CDCl3) δ 11.9, 16.3, 24.7, 29.7, 35.6, 36.1, 42.9, 54.7, 57.9, 58.4, 58.8, 65.1, 66.4, 69.4, 69.7, 79.4, 101.9, 106.9, 107.4, 128.8, 129.4, 130.1, 133.1, 137.2, 159.8, 160.5, 171.1, 172.9. HRMS calcd (M+H)+: 594.2946; found 594.2960. LC-MS Purity System A: tR = 5.78 min, 100%; System B: tR = 3.95 min, 98%. Compound 23 (colorless solid) was synthesized from 12a according to the general procedures B-D using phenol H. [α]D22 +7.0 (c 0.1, MeOH); 1H NMR (300 MHz, CDCl3) δ 0.89-0.99 (m, 6H), 1.01-1.18 (m, 1H), 1.40-1.54 (m, 1H), 1.91-2.03 (m, 1H), 2.04-2.28 (m, 2H), 2.44 (s, 3H), 3.06-3.14 (m, 1H), 3.44 (s, 3H), 3.81-3.92 (m, 3H), 4.00 (dd, J = 4.8, 9.5 Hz, 2H), 4.35 (d, J = 5.8 Hz, 1H), 4.40 (dd, J = 4.7, 9.1 Hz, 1H), 6.92 (d, J = 9.1 Hz, 2H), 7.00 (d, J = 9.1 Hz, 1H), 7.09 (app. t, JHH= JHF = 8.7 Hz, 2H), 7.14-7.29 (m, 4H), 7.41-7.51 (m, 4H), 7.60-7.67 (b, 1H), 13C NMR (75.5 MHz, CDCl3) δ 11.9, 16.3, 24.7, 35.6, 36.2, 42.9, 54.8, 57.9, 58.4, 66.3, 69.5, 79.4, 115.1, 115.7 (d, JCF = 21.5 Hz, 2C), 128.3, 128.4 (d, JCF = 8.0 Hz, 2C), 128.8, 129.4, 133.2, 133.7, 136.9, 137.5, 158.0, 162.3 (d, JCF = 245.9 Hz), 171.2, 172.9. HRMS calcd (M+H)+: 600.2641; found 600.2653. LC-MS Purity System A: tR = 6.10 min, 98%; System B: tR = 5.37 min, 96%. Compound 24 (colorless solid) was synthesized from 21 according to the general procedure E. [α]D22 -2.0 (c 0.1, MeOH); 1H NMR (300 MHz, CDCl3) δ 0.85-0.98 (m, 6H), 1.03-1.20 (m, 1H), 1.39-1.55 (m, 1H), 1.74-2.01 (m, 3H), 2.02-2.24 (m, 3H), 2.85 (s, 3H), 3.29 (s, 3H), 3.35 (s, 3H), ), 3.44 (t, overlapped, J = 6.3 Hz, 2H), 3.46 (s, 3H), 3.85-3.91 (m, 1H), 4.02 (t, J = 6.3 Hz, 2H), 4.14-4.20 (m, 2H), 4.25-4.44 (m, 5H), 6.57-6.62 (m, 2H), 6.93 (d, J = 8.0 Hz, 1H), 6.99-7.10 (m, 2H), 7.11-7.23 (m, 4H), 7.24-7.32 (m, 2H), 7.33-7.41 (m, 2H), 7.45-7.52 (m, 3H), 7.57 (d, J = 7.1 Hz, 1H), 7.67 (d, J = 8.0 Hz, 1H), 7.87 s, 1H); 13C NMR (75.5 MHz, CDCl3) δ 11.6, 16.1, 25.0, 29.6, 35.7, 35.9, 36.6, 38.1, 43.0, 53.7, 57.9, 58.5, 58.8, 65.5, 66.9, 67.4, 69.3, 79.9, 100.7, 106.1, 124.6, 124.9, 125.7, 126.6, 128.0, 128.9, 129.3, 129.6, 129.7, 130.0, 131.5, 133.4, 135.5, 136.8, 138.4, 142.2, 157.0, 159.0, 167.0, 171.1, 172.8. HRMS calcd (M+H)+: 881.3562; found 881.3574. LC-MS Purity System A: tR = 10.68 min, 98%; System B: tR = 6.58 min, 97%. Compound 25 (colorless solid) was synthesized from 21 according to the general procedure E using acid B. [α]D22 -14 (c 0.1, MeOH); 1H NMR (300 MHz, CDCl3) δ 0.86-0.98 (m, 6H), 1.01-1.18 (m, 1H), 1.39-1.53 (m, 1H), 1.52 (d, J = 7.1 Hz, 3H), 1.89-2.09 (m, 4H), 2.11-2.24 (m, 1H), 2.84 (s, 3H), 3.27 (s, 3H), 3.32 (s, 3H), 3.43 (t, overlapped, J = 6.3 Hz, 2H), 3.45 (s, 3H), 3.68 (bs, 1H), 3.79-3.85 (m, 1H), 4.00 (t, J = 6.2 Hz, 2H), 4.08-4.23 (m, 3H), 4.26-4.41 (m, 4H), 5.20-5.32 (m, 1H), 6.57-6.62 (m, 2H), 7.03-7.14 (m, 5H), 7.15-7.43 (m, 12H), 7.47 (d, J = 7.7 Hz, 2H), 7.95 (s, 1H), 7.98 (s, 1H), 8.19 (s, 1H); 13C NMR (75.5 MHz, CDCl3) δ 11.6, 16.1, 22.0, 25.0, 29.6, 35.3, 35.8, 36.7, 38.1, 42.9, 50.1, 54.0, 57.8, 58.5, 58.8, 65.6, 66.6, 67.1, 69.4, 79.5, 100.8, 106.1, 124.6, 126.5, 126.6, 127.7, 128.0, 128.8, 128.9, 129.5, 129.7, 131.5, 133.2, 135.8, 136.0, 137.0, 138.5, 142.4, 143.2, 157.1, 159.1, 165.0, 166.5, 171.2, 173.1. HRMS calcd (M+H)+: 1028.4246; found 1028.4200. LC-MS Purity System A: tR = 11.42 min, 100%; System B: tR = 7.13 min, 100%. Compound 26 (white solid) was synthesized from 12b according to the general procedures A-D. [α]D22 -30 (c 0.1, MeOH); 1H NMR (300 MHz, CD3OD): δ 0.84-0.96 (m, 9H), 1.10-1.28 (m, 2H), 1.44-1.67 (m, 4H), 1.79-1.96 (m, 3H), 2.50-2.60 (m, 1H), 2.98 (q, J = 5.8 Hz, 1H), 3.27 (s, 3H), 3.43 (t, J = 6.3 Hz, 2H), 3.62-3.68 (m, 1H), 3.90-3.95 (m, 1H), 3.99-4.08 (m, 3H), 4.24 (d, J = 8.8 Hz, 1H), 4.34 (d, J = 7.7 Hz, 2H), 6.58-6.65 (m, 2H), 7.06 (t, J = 8.9 Hz, 2H), 7.17 (d, J = 8.2 Hz, 1H), 7.24-7.41 (m, 4H), 7.42-7.7.46 (m, 2H); 13C NMR (75.5 MHz, CD3OD): δ 11.1, 12.3, 16.0, 26.2, 27.8, 30.4, 37.6, 37.8, 43.3, 46.3, 56.3, 58.9, 59.3, 66.4, 70.2, 70.3, 70.6, 101.7, 107.3, 115.4 (d, JCF = 21.2 Hz, 2C), 124.3, 129.5, 130.3, 132.0, 132.2 (d, JCF = 7.7 Hz, 2C), 134.0, 136.0, 136.1, 138.7, 158.1, 160.9, 163.1 (d, JCF = 244.6 Hz, 1C), 173.8, 178.3. HRMS calcd (M+H)+: 686.3372; found 686.3376. LC-MS Purity System A: tR = 6.92 min, 100%; System B: tR = 5.58 min, 100%. Compound 27 (white solid) was synthesized from 12c according to the general procedures A-D. [α]D22 -5 (c 0.1, MeOH); 1H NMR (300 MHz, CD3OD): δ 0.83-0.88 (m, 6H), 1.12-1.26 (m, 1H), 1.46-1.54 (m, 1H), 1.64-1.72 (m, 1H), 1.79-1.86 (m, 1H), 1.92 (t, J = 6.3 Hz, 2H), 2.70-2.76 (m, 1H), 2.88-3.00 (m, 3H), 3.27 (s, 3H), 3.43 (t, J = 6.3 Hz, 2H), 3.65-3.71 (m, 1H), 3.88-3.93 (m, 1H), 4.02 (t, overlapped, J = 6.3 Hz, 2H), 4.03-4.05 (m, 1H), 4.19 (d, J = 8.1 Hz, 1H), 4.26 (s, 2H), 6.57-6.63 (m, 2H), 7.04-7.31 (m, 12H), 7.41-7.46 (m, 2H); 13C NMR (75.5 MHz, CD3OD): δ 11.3, 16.0, 26.1, 30.4, 37.6, 37.9, 40.4, 43.3, 46.5, 56.2, 58.9, 59.3, 66.4, 70.2, 70.6, 101.7, 107.3, 115.4 (d, JCF = 21.4 Hz, 2C), 124.4, 127.4, 129.4, 129.5, 130.1, 130.2, 132.0, 132.2 (d, JCF = 8.1 Hz, 2C), 134.0, 136.1, 138.7, 140.6, 158.1, 160.9, 163.0 (d, JCF = 243.9 Hz, 1C), 173.3, 177.6. HRMS calcd (M+H)+: 748.3529; found 748.3540. LC-MS Purity System A: tR = 7.69 min, 98%; System B: tR = 6.34 min, 96%. Compound 28 (colorless oil) was synthesized from 12c according to the general procedures A-D using amine P. [α]D22 +10 (c 0.1, MeOH); 1H NMR (300 MHz, CD3OD): δ 0.84-0.92 (m, 6H), 1.08-1.20 (m, 1H), 1.45-1.53 (m, 1H), 1.58-1.66 (m, 1H), 1.69-1.74 (m, 1H), 1.92 (quintet, overlapped, J = 6.3 Hz, 2H), 1.88-1.98 (m, 1H), 2.72-2.91 (m, 4H), 2.95-3.01 (m, 2H), 3.26 (s, 3H), 3.42 (t, J = 6.3 Hz, 2H), 3.67-3.73 (m, 1H), 3.86-3.94 (m, 2H), 4.01 (t, overlapped, J = 6.3 Hz, 2H), 4.00-4.05 (m, 1H), 6.42-6.63 (m, 2H), 7.02-7.12 (m, 5H), 7.15-7.19 (m, 5H), 7.41-7.46 (m, 2H); 13C NMR (75.5 MHz, CD3OD): δ 11.8, 16.1, 26.1, 30.4, 37.4, 38.1, 40.6, 46.0, 47.1, 54.3, 56.3, 58.9, 66.4, 70.2, 70.3, 70.6, 101.7, 107.3, 114.9, 115.4 (d, JCF = 21.2 Hz, 2C), 122.2, 124.4, 127.4, 129.4, 129.7, 130.1, 130.2, 132.0, 132.1 (d, JCF = 8.0 Hz, 2C), 136.1, 140.8, 148.7, 158.1, 160.9, 163.1 (d, JCF = 244.2 Hz, 1C), 177.6. HRMS calcd (M+H)+: 720.3580; found 720.3596. LC-MS Purity System A: tR = 8.50 min, 100%; System B: tR = 7.11 min, 96%. Compound 29 (colorless oil) was synthesized from 12d according to the general procedures A-D. [α]D22 -12 (c 0.1, MeOH); 1H NMR (300 MHz, DMSO-d6): δ 0.75-0.82 (m, 9H), 0.87 (d, J =6.9 Hz, 3H), 1.08-1.17 (m, 1H), 1.21-1.25 (m, 1H), 1.40-1.48 (m, 1H), 1.60-1.78 (m, 3H), 1.82-1.90 (m, 2H), 2.21-2.31 (m, 1H), 2.78-2.83 (m, 1H), 3.20 (s, 3H), 3.37 (t, J = 6.3 Hz, 2H), 3.43-3.49 (m, 1H), 3.75-3.81 (m, 1H), 3.93 (dd, J = 6.9, 9.3 Hz, 1H), 4.00 (t, J = 6.3 Hz, 2H), 4.15-4.33 (m, 3H), 6.554-6.59 (m, 2H), 7.16-7.24 (m, 5H), 7.31-7.35 (m, 2H), 7.44-7.49 (m, 2H), 7.69 (d, J = 9.0 Hz, 1H), 8.49 (t, J = 6.0 Hz, 1H); 13C NMR (75.5 MHz, DMSO-d6): δ 10.6, 15.4, 20.2, 20.6, 24.4, 28.8, 30.5, 34.0, 36.1, 41.3, 49.0, 54.6, 56.7, 57.9, 65.0, 68.1, 68.4, 70.3, 100.2, 106.1, 114.6 (d, JCF = 21.2 Hz, 2C), 121.4, 128.0, 129.0, 130.8, 130.9, 131.2, 134.3, 138.4, 156.2, 159.5, 160.9 (d, JCF = 243.3 Hz, 1C), 171.4, 174.4. HRMS calcd (M+H)+: 700.3529; found 700.3547. LC-MS Purity System A: tR = 7.27 min, 100%; System B: tR = 5.79 min, 98%. Compound 30 (colorless oil) was synthesized from 12d according to the general procedures A-D using amine P. [α]D22 -11 (c 0.1, MeOH); 1H NMR (300 MHz, DMSO-d6): δ 0.75-0.88 (m, 12H), 1.09-1.21 (m, 1H), 1.24-1.29 (m, 1H), 1.45-1.52 (m, 1H), 1.60-1.65 (m, 3H), 1.86 (quintet, J = 6.3 Hz, 2H), 2.17-2.24 (m, 1H), 2.81-2.85 (m, 1H), 2.97-3.15 (m, 2H), 3.19 (s, 3H), 3.37 (t, J = 6.3 Hz, 2H), 3.42-3.51 (m, 1H), 3.77-3.82 (m, 1H), 3.92-3.95 (m, 2H), 3.99 (t, J = 6.3 Hz, 2H), 5.46-5.50 (m, 1H), 6.50-6.62 (m, 4H), 7.05 (d, J = 2.2 Hz, 2H), 7.16-7.22 (m, 3H), 7.44-7.51 (m, 2H); 13C NMR (75.5 MHz, DMSO-d6): δ 11.3, 15.4, 20.2, 20.7, 24.5, 28.7, 30.3, 35.6, 40.9, 44.3, 49.5, 51.3, 54.8, 57.9, 65.0, 68.2, 68.4, 100.2, 106.1, 111.9, 113.2, 114.6 (d, JCF = 21.2 Hz, 2C), 118.7, 121.5, 128.5, 130.8, 130.9, 134.3, 147.6, 156.2, 159.4, 162.5, 174.6. HRMS calcd (M+H)+: 672.3580; found 672.3593. LC-MS Purity System A: tR = 8.04 min, 98%; System B: tR = 5.88 min, 96%. We thank Medivir AB for financial support, and for performing the biological testing. We also want to thank Kurt Benkestock, Medivir AB, for help with HRMS measurements. Melnikova I. Therapies for Alzheimer's disease Nat Rev Drug Discov 2007; 6: 341-2. Hardy J, Selkoe D J. The amyloid hypothesis of Alzheimer's disease: progress and problems on the road to therapeutics Science 2002; 297: 353-6. Luo Y, Bolon B, Kahn S, et al. Mice deficient in BACE1, the Alzheimer's beta-secretase, have normal phenotype and abolished beta-amyloid generation Nat Neurosci 2001; 4: 231-2. Roberds S L, Anderson J, Basi G, et al. BACE knockout mice are healthy despite lacking the primary beta-secretase activity in brain implications for Alzheimer's disease therapeutics Hum Mol Genet 2001; 10: 1317-24. Johansson P O, Lindberg J, Blackman M J, et al. Design and synthesis of potent inhibitors of plasmepsin I and II: X-ray crystal structure of inhibitor in complex with plasmepsin II J Med Chem 2005; 48: 4400-9. Rahuel J, Rasetti V, Maibaum J, et al. Structure-based drug design: the discovery of novel non-peptide orally active inhibitors of human renin Chem Biol 2000; 7: 493-504. Bäck M, Nyhlén J, Kvarnström I, et al. Design, synthesis and SAR of potent statine-based BACE-1 inhibitors: exploration of P1 phenoxy and benzyloxy residues Bioorg Med Chem 2008; 16: 9471-86. Björklund C, Oscarson S, Benkestock K, et al. Design and synthesis of potent and selective BACE-1 inhibitors J Med Chem 2010; 53: 1458-64. 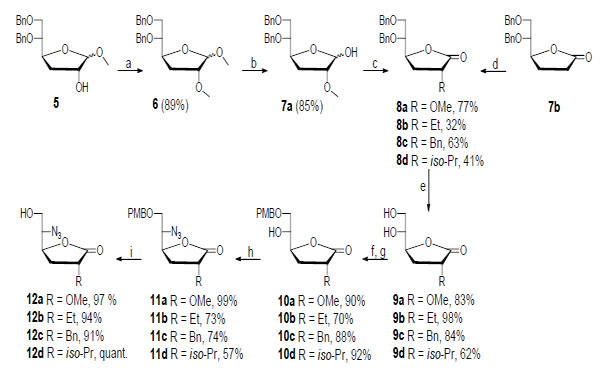 Simas A B C, Coelho A L, Costa P R R. Regioselective Lithiation of Resorcinol Derivatives: Synthesis of Mono O-MOM- and O-Benzylresorcinols Prenylated at C-2 or C-4 Positions Synthesis-Stuttgart 1999; 1017-21. Stachel S J, Coburn C A, Steele T G, et al. Structure-based design of potent and selective cell-permeable inhibitors of human beta-secretase (BACE-1) J Med Chem 2004; 47: 6447-50. Arslan T, Abraham A T, Hecht S M. Structurally altered substrates for DNA topoisomerase I. Effects of inclusion of a single 3'-deoxynucleotide within the scissile strand Nucleos Nucleot 1998; 17: 515-30. Wångsell F, Gustafsson K, Kvarnström I, et al. Synthesis of potent BACE-1 inhibitors incorporating a hydroxyethylene isostere as central core Eur J Med Chem 2010; 45: 870-82. Rasmussen J R, Slinger C J, Kordish R J, Newman-Evans D D. Synthesis of deoxy sugars. Deoxygenation by treatment with N,N'-thiocarbonyldiimidazole/tri-n-butylstannane J Org Chem 1981; 46: 4843-6. Rondot B, Durand T, Girard J P, et al. A Free-Radical Route to Syn Lactones and Other Prostanoid Intermediates in Isoprostaglandin Synthesis Tet Lett 1993; 34: 8245-8. Muller M, Huchel U, Geyer A, Schmidt R R. Efficient intramolecular glycosylation supported by a rigid spacer J Org Chem 1999; 64: 6190-201. Crich D, Vinogradova O. Facile oxidative cleavage of 4-O-benzyl ethers with dichlorodicyanoquinone in rhamno- and mannopyranosides J Org Chem 2007; 72: 3581-4. Tagad H D, Hamada Y, Nguyen J T, et al. 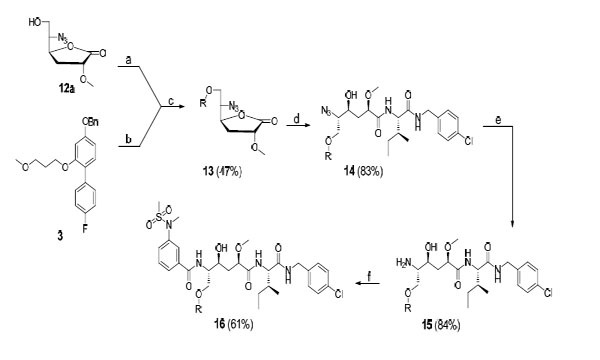 Structure-guided design and synthesis of P1' position 1-phenylcycloalkylamine-derived pentapeptidic BACE1 inhibitors Bioorg Med Chem 2011; 19: 5238-46.